Classroom Space Archives - Page 2 of 5 - Teaching Rocks! I thought it would be fun to let my students choose a song and illustrate it in this manner. We started off our lesson by looking at songs as poetry (so I could include some of my favourites) and then we discussed how and why songwriters express their feelings and experiences. Students were asked to choose a song that they found inspirational and illustrate it using various fonts (we looked at FontSpace for ideas) and then used some graphic design elements to illustrate their chosen section of lyrics. Once the illustrations were completed, students worked on a written response where they reflected on their song choice, the meaning of the lyrics, and why they found those lyrics inspirational. Since we are working on making connections for our TLCP cycle, I also had my students connect the song lyrics to one of their previous experiences. Note: My apologies if this post showed up in your reader numerous times! I have no idea what happened and why it posted at least five times…but hopefully all issues have been fixed! The Tuesday 12: 12 Inspirational Dr. Seuss Quotes! 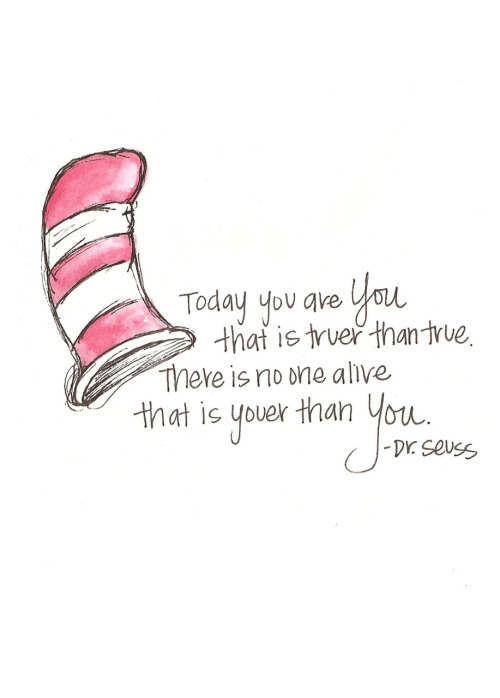 In this week’s edition of the Tuesday 12, we’ll look at 12 inspirational Dr. Seuss quotes. For each one, I have linked you to a graphic that displays the quote. Just click each quote to see the graphic! Want more words of wisdom from Dr. Seuss? Here’s a great graphic that lists so many more! The new year brings about the opportunity for our students to make new goals. Perhaps they would like to try something new, improve their grades, or simply better themselves. I’ve heard many of my students say, “But I’m just not good at it” when they are faced with a new experience or challenge. It is vital that our students understand that anything is possible and they can achieve their goals…through a little work and perseverance. Have you helped your students set goals for themselves? If you are unsure where to start, we have provided a lesson, rationale, and student goal setting worksheets in one of our TeachHUB.com articles. This worksheet allows students to break up a larger goal into smaller and more manageable tasks. But sometimes, the process of reaching the goal is not the problem. The main thing that may be hampering student success is their attitude—if they don’t believe that they can be successful, then they will not be successful. It’s a self-fulfilling prophecy. So many of our students psych themselves out before even trying anything because they don’t have the self-confidence to believe that they can do it. It is critical that we help our students believe in themselves so that they can dream and achieve their goals. Here’s one of our favourite poem written by the one and only Shel Silverstein. It’s simple, beautiful, and so true. As always, click on the image for the FREE printable poster. Don’t forget to visit us next Wednesday for another FREE classroom poster! Right now we are working on the novel “Shakespeare’s Secret” by Elise Broach. It’s a great novel filled with Shakespearean/Elizabethan history, references, and intrigue…but that’s not really the topic of this post. As we read the novel, we work on various activities, one of which is chapter written responses. I’m not a fan of a bunch of short answer questions for each chapter or a chapter synopsis, as I’d prefer to give my students 1 or 2 “meatier” questions to work on…something that would involve higher order thinking, analysis, and application. The problem I have, however, is that a paragraph answer is too brief for this type of analysis, while a five paragraph essay is simply too long. My solution is a one page response, but my students have some trouble determining a main idea and finding supporting details. Since I love the P.E.E.L. framework, I’ve created a simple graphic organizer to help them layout their main idea, supporting details, and text-based evidence. As I explained in a previous post, instead of including the “L” as a link to the next paragraph, we use “L” as linking to a connection (text-to-text, -to-self, or -to-world) and my students tend to prefer “explanation” then “evidence” in their writing (and I agree with them). So, simply click on the image below for the free printable. Students simply record their ideas in the chart and then write out their written response. Would you like these PEEL posters for your classroom? Just click the image below! They’re FREE! We are almost mid-way through November and our students are beginning to have their first round of colds, sniffles and flus. They come in and they sneeze here and there, they touch their desks and the resources we have in our classrooms. Unfortunately, due to the constraints that families have today, most of these students should be at home recuperating but have no where or no one to be with during the day so they are sent to school. What can we do? They are there with us, with everyone else in the classroom and they are spreading their germs. It is vitally important that we protect ourselves and keep our classrooms as clean as possible. Many of us take precautions and help students be more aware of their classroom environment. From disinfecting students desk tops, and seat backs, to door knobs, our desks and classroom materials we attempt to keep the germs at bay. I ask students to bring in their own hand sanitizer and ask them to use it constantly during class time. Furthermore, I have each student donate one tissue box for classroom use. Unfortunately, we are not allowed to bring in store bought disinfectants into the schools. These disinfectants have toxins that students should not be exposed to and can be harmful to them and us. So the endeavour began, and through my friends on Pinterest, I have found DIY disinfectants and cleansers that can be used in my classroom. Just click on the picture below and you will find a detail of four wonderful and fantastically easy cleaners that are safe! I have found that I only need two of the four: the antibacterial spray and the all purpose cleaner for my classroom! But I’m sure you will be very impressed with the results! Happy Cleaning & Be Healthy!